In a small bowl, whisk together honey, garlic, soy sauce, rice vinegar, sesame oil, ginger, Sriracha and pepper, to taste. 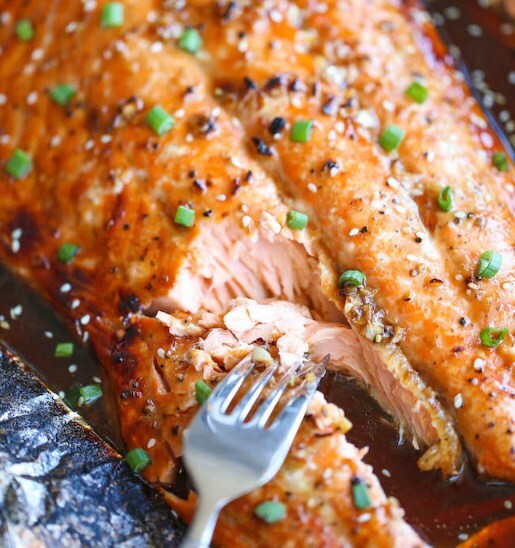 Place salmon onto the prepared baking sheet and fold up all 4 sides of the foil. Spoon the honey mixture over the salmon. Fold the sides of the foil over the salmon, covering completely and sealing the packet closed. Place into oven and bake until cooked through, about 15-20 minutes. * Open the packet and broil for 2-3 minutes, or until caramelized and slightly charred.